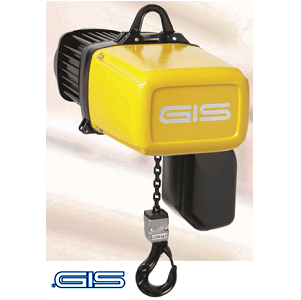 The GIS GCH electric chain hoist can handle loads up to 5000kg. It has many excellent features as well as numerous options to further enhance the hoist. 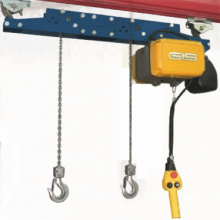 The GIS GCH Electric Chain Hoist has been in production since early 2005, so whilst it is older than the GPM and GP hoist ranges it is still a highly regarded electric chain hoist. 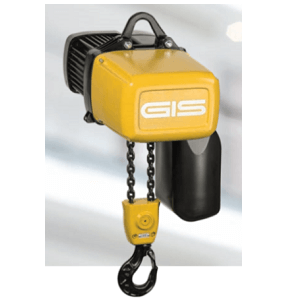 The GCH electric hoist comes in a huge choice of lifting capacities which range from the lightest at 40kg up to the heaviest capacity at 5000kg. 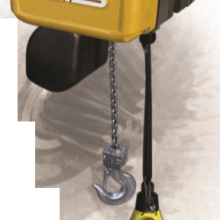 The hoists design is robust and compact and has an IP55 protection class, an IP65 option is available if required. There are many innovative features and components on the GCH hoisting systems which we have briefly outlined here. BRAKE: The maintenance free disc brake system has been positioned after the slip clutch for the highest safety levels possible. SLIP CLUTCH: The double slip clutch can easily be precisely adjusted. It is very resistant to wear and is maintenance free. The double slipping clutch gives the hoist the highest possible overload protection. CHAIN WHEEL & GUIDE: The steel hardened chaining wheel has added 4mm chain pockets and double ball bearings for smooth operation. The chain guide component consists of 2 parts to optimize maintenance and is made from a highly wear resistant, reinforced plastic. These help to eliminate any jamming throughout operations. The chain guide can be removed without the need to take the hoist apart. 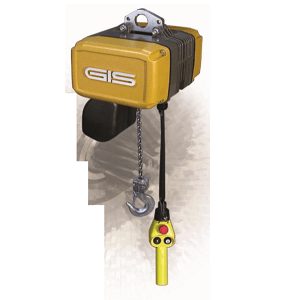 LIMIT SWITCH: The limit switch comes in a geared format as standard on the GIS GCH electric hoist, suitable for chain lengths up to 120 metres. The switch is easy to precisely adjust to suit your requirements. TRANSMISSION: The geared transmission system is permanently lubricated and consists of helically toothed 1st & 2nd gears, this reduces noise levels during operation. CONTROL SYSTEM: The contactor controls use simple technology to ensure there is no interference. The low 42v control permits the highest safety in use, there is also an emergency stop as standard. The control switch unit (pendant controller) incorporates a built-in support wire as standard. There are different options available, a 2 button ergonomic pendant control or a 4 button with counter options. HOISTING CHAIN: The lifting chain has been zinc plated and surface hardened. 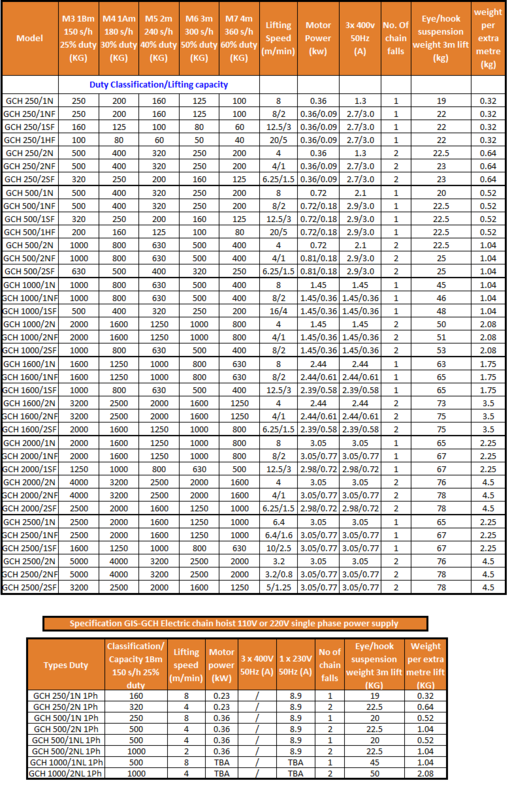 It has been specially calibrated for GIS hoists. The end of the chain is fixed to the hoist body. 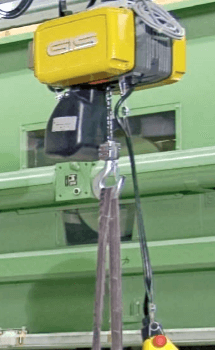 These hoists can are easy to convert from a single to a double chain fall to essentially double the lifting capacity. MOTOR: The motor on the GCH hoisting units have been designed to be used in tough conditions. The motor has various options available; single or dual speed; normal, fast or super fast speeds; temperature control systems and special voltages (single phase models are the standard). 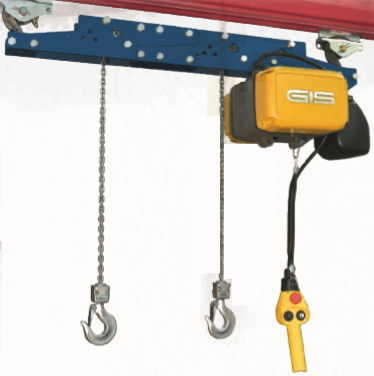 The GIS GCH electric chain hoist system can be configured to suit a variety of situations. Low headroom options up to 3200kg are available. The synchronic lifting system for handling long and bulky loads enables the precise parallel run of 2 or 4 load hooks. Lifting Hoists Direct can also supply the chain handy tool plus a telescopic tool for precise, single handed lifting operations. These are for use up to 250kg only. Other options include climbing and lifting hoists suitable for the entertainment industries and also ATEX rated hoist units for use in hazardous environments.